pumpkin cheesecake | Live Cheap, Feel Rich! I know that it’s Wednesday, which means it’s freezer meal day, but it is also, EQUALLY IMPORTANTLY, #NationalPumpkinCheesecakeDay. I frankly cannot imagine a more decadent, delicious, or more seasonal dessert, and it just so happens that an important part of this recipe is freezing it, so this doubles up our Wednesday to accommodate both LCFR priorities! What’s awesome about Chelsea’s Messy Apron’s recipe is that it has such a unique spin on pumpkin cheesecake. It is a hybrid of cheesecake, ice cream, and pumpkin pie. 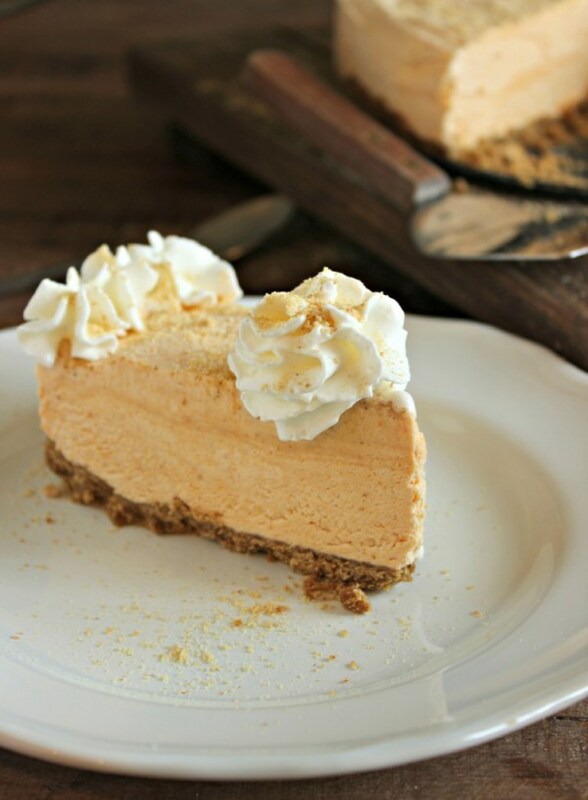 The pie is frozen to give it an ice-creamy texture, the cheesecake flavor comes from cream cheese, and the pumpkin pie flavor comes from regular pumpkin with some pumpkin pie spice. It’s the perfect combination of flavors – you’ll agree. Most importantly, this recipe is crazy easy with a prep time of only 15 minutes, and a total time of 15 minutes. That means all you’re doing is prepping and freezing – yes, please! Ingredients include cinnamon graham crackers, light brown sugar, butter, pumpkin puree, cream cheese, cool whip, sweetened condensed milk, pumpkin pie spice, and butter extract. To make the crust, you simply blend the graham crackers and stir in brown sugar and softened butter, and then press the mixture into the bottom of a spring form pan – place in the freezer while you make the filling! To make the filling, beat cream cheese in a bowl until smooth, and then add pumpkin puree, pumpkin spice, and butter extract. Beat until combined and then slowly add in condensed milk until smooth. Fold in cool whip just until combined – be careful not to overwhip! Pour the mixture into the prepared crust and freeze overnight or for 6-8 hours. Let soften for about 10 minutes until serving.